Will Erdogan Keep Speaker Çiçek’s Promise? “The main opposition has voiced its gratitude to the parliamentary speaker for launching an initiative to release jailed lawmakers even as Prime Minister Recep Tayyip Erdogan played down hopes for a solution. “I thank Cemil Çiçek for his efforts and for the contribution he has made for arrested deputies,” Republican People’s Party (CHP) leader Kemal Kilicdaroglu told reporters yesterday inIstanbulafter an international conference on the Arab Spring process organized by his party. 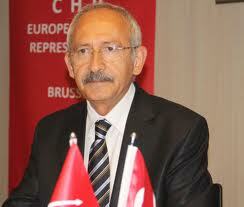 Kilicdaroglu was referring to a process initiated by Çiçek that brought together representatives of all four parties represented in Parliament to seek a solution to the arrested lawmakers’ debate. Eight lawmakers, two from the CHP, one from the Nationalist Movement Party (MHP) and five from the Peace and Democracy Party (BDP) were elected from jail in the June 12, 2011, elections. The courts have refused to release them, overriding precedents. The opposition parties have reportedly agreed on an amendment to Article 100 of the Criminal Procedures Law, under which lawmakers would be included in the scope of exemptions from pre-trial detention. If an inmate is elected as a lawmaker while awaiting trial, he or she will be immediately released. Their trials would continue, but if convicted, their sentences would be suspended until their parliamentary mandates expire. The ruling Justice and Development Party (AKP) has yet to make an official comment on the formula, but Erdogan yesterday slammed the opposition parties over the issue. Recalling that the problem was the product of the opposition parties’ decision to nominate candidates who were in prison, Erdogan accused the opposition of trying to put the blame on the ruling party. The parties have “disrespected the will of the people by nominating these persons,” Erdogan said at a meeting of his party’s youth branch in Ankara, adding that they would not accept an imposition on the issue. “The parliamentary speaker has an initiative on arrested deputies. We’ll evaluate the results of his meetings with three oppositional parties in our party organs. But we will never allow these opposition parties’ efforts to pass the buck onto us,” Erdogan said.